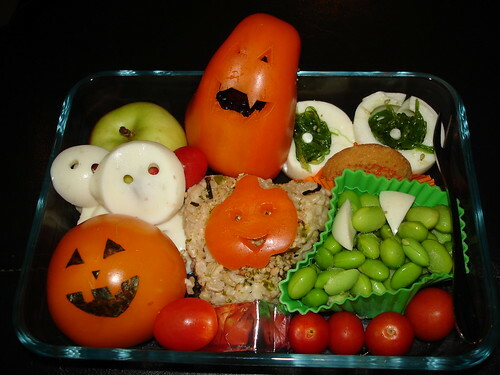 I haven’t had any time to make a Halloween themed bento this year, since I’m still working on the recipes for my book. 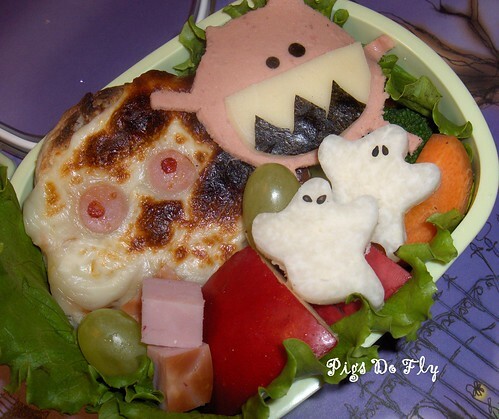 But many talented bentoists in the Just Bento flickr pool  have been busy making some really scary-cute bentos! It just goes to show that, contrary to some misplaced assumptions , it’s not just Japanese moms that can get very creative with bentos. Here are a few that caught my eye. 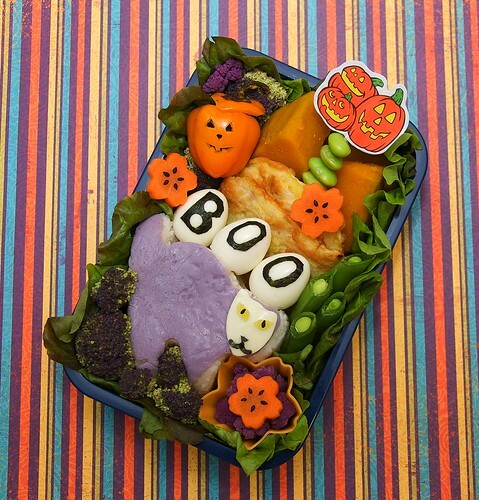 This bento by gamene  makes great use of themed stickers and the rather weird color of purple broccoli for that spooky look. Check out the detail of the carved ‘pumpkin’ mini-pepper! 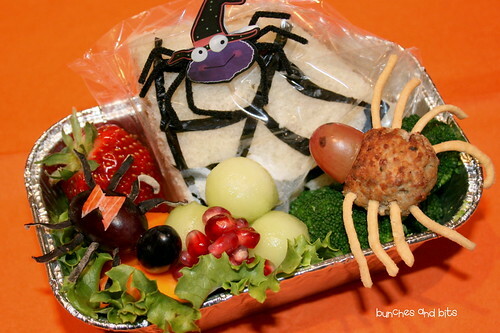 This one by Bunches and Bits  has a spider-web (made of cut nori) covered sandwich, and a big, scary spider with a meatball body. It also uses a themed sticker creatively. mirdreams  makes great use of the autumnal colors of sweet pepper and tomatoes, with Jack-o-lantern faces of course! The egg white faces are nice and ghostly. MandLmom  makes a slightly overtoasted English muffin look like a bug-eyed mummy. The jicama ghosts are ghoulishly semi-transparent, which is a great touch. 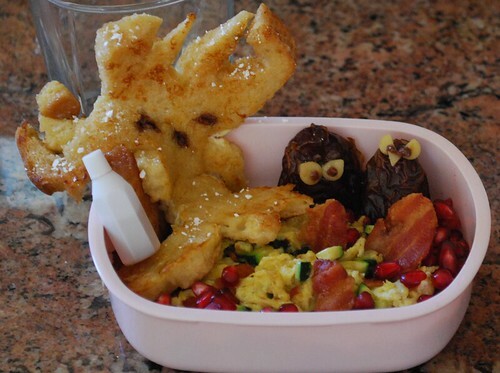 I’m not quite sure what that monster climbing out of Judy’s Notebook ’s bento is, but it’s scary, as are the baleful owls. The milk bottle is a mystery to ponder. 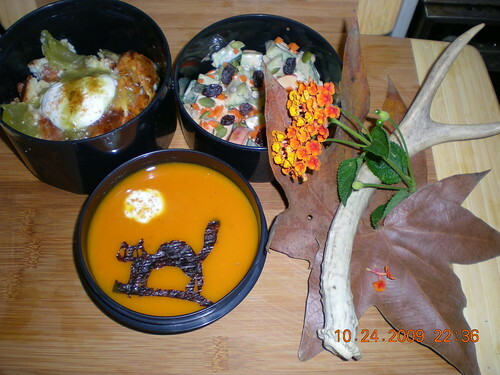 Here’s another spooky cat themed bento, from MAHOUTAKE . 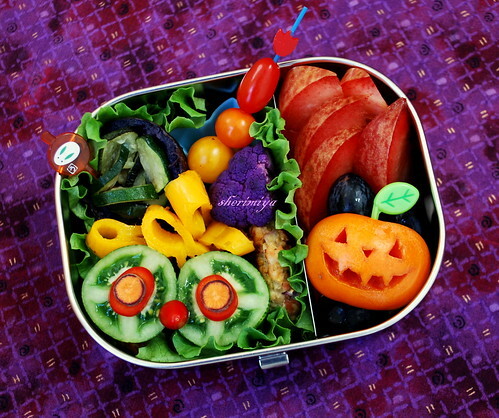 And last but not least, check out this Jack-o-lantern bento by the always talented sherimiya . I really like the direction that many non-Japanese charaben artists are taking, as seen in these photos. Instead of relying on colored molded rice, sausages or fish products and thin omelettes (usuyaki tamago) as most Japanese charabens do, they are using the natural, vibrant colors and textures of vegetables and fruit very creatively. Kudos to you all! And however you choose to celebrate it, have a great Halloween and/or All Hallow’s Day!